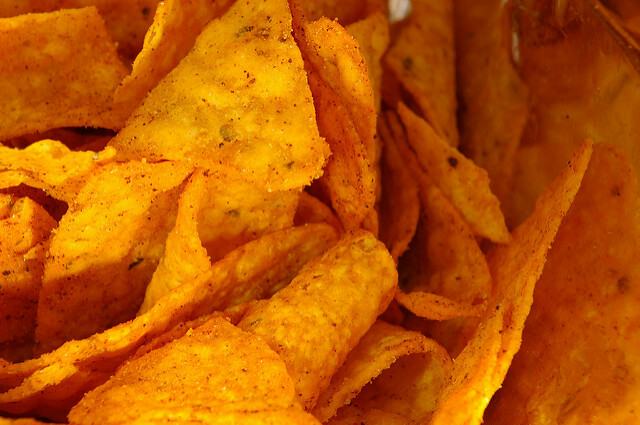 Doritos are statistically listed as the most popular chips worldwide. Before you buy another bag, you may want to take a look at the ingredients. Vegetable Oil: Most vegetable oils are genetically modified. Almost 90 % of canola and corn oil in America is GMO. Soy, corn, safflower and canola oils are dangerous to cook with as they contain very high amounts of Omega-6. Omega-6 is only beneficial for our bodies if the ratio of Omega-6 and Omega-3 is 3 to 1. Omega-3 sources include fatty fish and cod liver oil. As a nation, we do not consume enough of these. The current ratio in America is at 50:1. Our culture is way to indulged in processed pre-packaged food, so adding foods cooked with vegetable oil make matters even worse. Cheddar Cheese (milk, cheese cultures, salt, enzymes): Pasteurized cow’s milk on an industrial commercial level is loaded with unhealthy components such growth hormone and GMOs. Doritos contain hormones that lead to breast cancer. Yellow #6: Can cause cancer, hyperactivity, allergic reactions, diarrhea, vomiting, nettle rash, migraines and swelling of the skin. Yellow #5: Can cause allergic reactions, hyperactivity, cancer. Red #40: Damages DNA, causes swelling around the mouth, hives, hyperactivity in children and cancer. Maltodextrin: Maltodextrin is a commercial sweetener made from cornstarch. Almost all the maltodextrin used in health foods, vitamins, and supplements are derived from genetically modified corn. Abdominal bloating and flatulence can be experienced; other problems relating to digestion can also become a problem such as constipation and diarrhea. Citric Acid: Citric acid is used as both a flavor enhancer and a preservative ingredient. Citric acid has been known to irritate the digestive system , causing heartburn and damage to the mucous membrane of the stomach. According to a few European studies, citric acid could be responsible for promoting tooth decay as well. Corn Syrup Solids: This is precisely the ingredient that is contributing to the obesity in the United States. Fructose can disturb your metabolism, elevate blood pressure and triglycerides, cause weight gain, heart disease and liver damage, and even deplete your body of vitamins and minerals. Doritos also contain acrylamides — toxic substances formed when carbohydrates are cooked a high temperatures. Acrylamides are linked to cancer and other serious diseases. One study shows that eating acrylamides increases the risk of kidney cancer by 59 percent. ← Get Rid Of A Sinus Infection Fast. NATURALLY! This Fruit Fights Insomnia and Boosts Brain Function in Minutes!